The lens of the eye focuses light that enters through the pupil. The light rays must be focused precisely onto the retina to form a sharp image. The lens is normally clear, like glass. However, it may become cloudy over time and this is called a cataract. Clouding of the lens is a natural aging process of the eye, and cataracts are a normal finding in people over 60. Cataracts can impair vision by blocking the amount of light entering the eye, making images dimmer. They can also scatter light rays instead of focusing them, making images blurry. Symptoms of glare, halos around lights, or even double vision can be produced by cataracts. Read more about them here. Cataract surgery is an outpatient procedure. It is typically performed while you are awake, but a sedative is given to reduce anxiety. Local anesthetic is used on the eye to numb it for the surgery. No stitches or shots are used. An ultrasound device is used to soften the cataract and remove it from the eye. 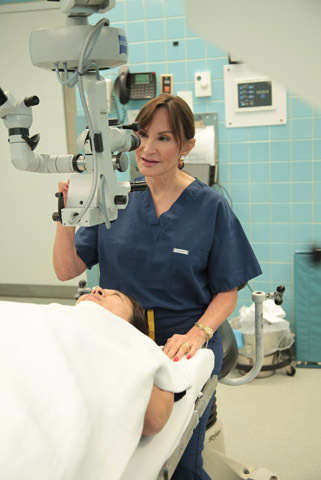 An intraocular lens implant is then carefully placed in the eye to replace the cloudy lens that was removed. You can read more information on cataract surgery here. For more information on Cataract Treatment in Chicago, IL call us at (312) 332-4296 today!